I’m always brewing new Modern decks, especially when spoiler season rolls around. After the novelty wears off, I inevitably find myself pulled back to my favorite card combinations. Goyfs, Bolts, cantrips; Temples, Mimics, Seers. I believe the decks that best house these respective combinations are Counter-Cat and Colorless Eldrazi Stompy, both of which I’ve tuned to finely match my playstyle preferences. But lately, I’ve again become enamored with an older creation of mine, and one that essentially mashes the two strategies together: TarmoDrazi. Today, we’ll take a look at my updates to the TarmoDrazi deck and assess the strategy’s prospects in the current metagame. TarmoDrazi was born from a joke gone wrong: the weekend following Eye of Ugin‘s banning, I brought a Simic Eldrazi deck containing the newly-legal Ancestral Vision and a playset of Goyfs to Fright Night Magic. But Goyf’s applications in the shell actually impressed me. A week later, I’d built the prototype. That first version received backlash for my continued inclusion of Serum Powder, a card I had yet to put on the map as a worthwhile tool in Modern Eldrazi decks. I closely analyzed Powder’s roles in the deck and finished by cutting it from my subsequent build. Version 1 also revealed the power of Traverse the Ulvenwald in a focused Tarmogoyf shell, and especially alongside the Eldrazi—when searching for Temple, Traverse functioned as a green Sol Ring, heavily incentivizing the deck to achieve delirium rapidly. Version 2 came about after the spoiling of Emrakul, the Promised End. I went into Temur colors for Thought Scour, which helped fill the graveyard for Emrakul, and included Oath of Nissa as a mini-Ancient Stirrings that added to delirium and found Tarmogoyf. Noble Hierarch was introduced to help with delirium, mana fixing, and speed. Blue also gave the deck Serum Visions, at the time a powerful cantrip, and Stubborn Denial, which insulated the shell against combo decks. Stubborn was nice; Serum was a bit slow. Same deal with Emrakul, which was regularly a worse Traverse find than Tarmogoyf. The project received new life when I remembered Architects of Will and went on another brewing spree. Version 3 employed Architects to make delirium more reliable. Emrakul and Oath were cut from this build, but spending mana on a blind cantrip wasn’t what the shell wanted to be doing. I abandoned TarmoDrazi a month later, when Wizards revealed Eternal Scourge, and got to work on Colorless Eldrazi Stompy. Abandoned until now, that is. After two years on Colorless, I’ve re-sleeved my Ancient Stirrings to update TarmoDrazi. As always, we’ll start with the list. 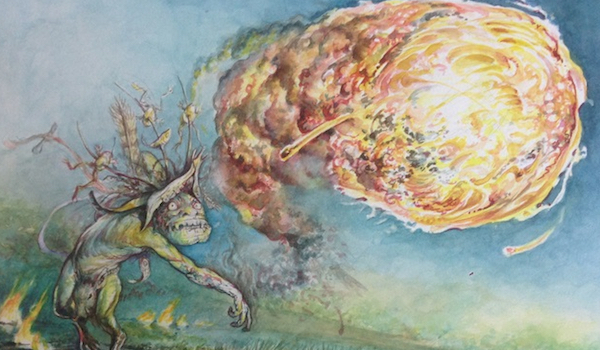 The contemporary TarmoDrazi deck improves on its predecessors in a few ways. For one, it’s sleeker. Full sets of Hierarch, Bauble, and Tarfire greatly enhance the deck’s speed, a crucial factor in this midrange-light format. Value-leaning cards like Matter Reshaper and Architects of Will have little merit here. Trimming Architects also has the benefit of relegating our blue splash to the sideboard. Faithless Looting further adds to our velocity factor, chewing through ill-fitting pieces in hand while growing Tarmogoyf and enabling Traverse the Ulvenwald in linear matchups. Those matchups have always peeved TarmoDrazi, as when opponents weren’t stripping our cards with Thoughtseize, amassing delirium could prove cumbersome. Looting even improves the midrange matchups by dumping lands for business in the mid-game. Of course, it doesn’t hurt that our “business” is midrange’s Public Enemy No. 1, Reality Smasher. Another crucial aspect of the deck is its resilience to graveyard hate. Rest in Peace seems great against TarmoDrazi on paper, but in practice, all it achieves is neutering Tarmogoyf and turning Traverse the Ulvenwald into Lay of the Land. That’s just eight cards it cripples. We’re still a deck with Thought-Knot Seer and Cavern of Souls, and remain fully capable of punishing opponents for deploying the enchantment on-curve. Modern already has a GR Eldrazi deck—the one with Obligators and Bloodbraid Elves. While that deck excels against large creatures, TarmoDrazi has a better time against small creatures thanks to its abundance of spot removal. Frequently having a 6/7 Goyf also pays dividends against those strategies, which are forced into chump-blocking. TarmoDrazi also gets the nod against combo decks, which similarly struggle against large Goyfs (not to mention Stubborn Denial). I think GR probably outperforms us against midrange, what with all its Goyf-stealing and Bloodbraid value. But we certainly don’t have a bad midrange matchup ourselves, what with all our… Eldrazi Temples. I feel like a more proactive, less rampy version of that deck that isn’t so dependent on opponents having creatures is well-positioned for this metagame of Hardened Scales, Tron, UW, and Burn. TarmoDrazi’s sideboard also helps with matchups historically tricky for Eldrazi decks. Kozilek’s Return fills in admirably for the heavy removal packages I’ve been forced to include in Colorless Eldrazi Stompy, but it certainly underwhelms against Humans. I also began without a blue splash, but added it back in for Stubborn Denial. This counterspell teams up with the accelerated beatdown plan of Hierarch, Goyf, and Seer to make most of our combo matchups—including spell-based aggro-combo decks, like Burn—a breeze. Lastly, Traverse gives us access to Magus of the Moon, which takes care of Valakut and UrzaTron decks alike. Here, we’ll dissect the individual components that make TarmoDrazi tick. Noble Hierarch remains critical to the strategy, baiting out removal and feeding the creature type to delirium. With Fatal Push in the picture, this role is more relevant than ever. I’ve found Looting and Bauble to buff our consistency enough that an early Goyf or Seer is par for the course. As such, additional early threats like Matter Reshaper, Eldrazi Obligator, or Bloodbraid Elf feel superfluous. Reality Smasher sits comfortably on top of the mana curve. As for Traverse bullets, the only two I’ve found worthwhile are Scavenging Ooze and Tireless Tracker. Both are go-tall creatures that can outgrow anything and break board stalls, but they do so in different ways. Ooze gets bigger faster and controls boards gummed up with Goyfs on either side. It also incidentally hates on the graveyard and gains life, hosing certain strategies. Sticking Ooze has been important in game 1s when it comes to turning off Snapcaster Mage, who’s already stretched thin against this deck thanks to all the Path to Exile targets. Tireless Tracker stays small for longer, but attacks opponents from a different angle entirely: with card advantage. Especially in a deck with Faithless Looting, drawing once (or twice) for each land drop can out-resource many Modern decks. I like to exchange resources with interactive opponents as much as possible before deploying Scooze or Tracker. That way, the creatures come down and just take over the game, à la Huntmaster of the Fells. Both creatures leave something to be desired against linear combo decks, although Scooze has applications against some of them, but their presence provides a mighty boon to our interactive matchups. Not coincidentally, these are the matchups in which we’re likeliest to have delirium active and find ourselves able to tutor up haymakers. After experimenting with varying numbers, I think 4 Tarfire is definitely correct. No other card in the deck is worth two card types. It turns out taking a minus in matchups with few Tarfire targets is worth having delirium active from the game’s outset. Lightning Bolt is technically a flex card here, but I think it performs well in the slot. 3 is much more than 2 when it comes to burning opponents out, and Modern has never been so stat-centric. There are some creatures, most notably Mantis Rider, that Tarfire just won’t kill. For everything else, there’s Dismember. This all-purpose kill spell is a shoe-in at 2. It nabs early Goyfs, lets us beat later ones, and clears the path of Gurmags and Baneslayers for Thought-Knot and friends. While I’ve discussed Traverse and Stirrings to death in the context of this shell, Bauble and Looting are relative newcomers (although I have experimented with Bauble here before). Let’s start with the artifact cantrip. At 0 mana, Bauble is just miles more efficient than Architects of Will. And we have enough library manipulation to make great use of the scry. Our land configuration gives us the option of scrying while making a turn one play a good chunk of the time. We can also Bauble before casting Traverse or Stirrings if we’re really looking for something specific, and hold off on the green cantrip until we draw the top card. Bauble even gives us super-Thoughtseize by looking at an opponent’s card before resolving Seer. I’ll admit that Bauble occasionally gets Looted away in the mid-game, but there’s no card I’d rather have in an opener. Since I’ve played Faithless Looting religiously in GRx Moon decks for years, I’m surprised in hindsight that I never tried it in TarmoDrazi. After all, Looting does plenty that we want—it cycles through extra lands, grows Tarmogoyf, and turbo-activates delirium. In game 2, it even helps find sideboard bullets we can’t Traverse for, like Stubborn Denial. Including Looting also makes hit-or-miss cards like Dismember less of a liability. The TarmoDrazi manabase is a tightrope walk of package balance, and I’m not sure I’ve found quite the right combination of lands yet. There are four types of lands vying for space among our precious 20 slots. 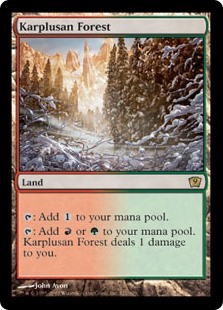 Colorless producers: Karplusan Forest seems like the better land, since a reach-inclusive aggro deck doesn’t really want to gain opponents life. But it seems including Grove of the Burnwillows has some merit, as with both lands in play, pilots can choose whether to give life or take damage. Similarly, seeing both lands off a Stirrings lets us select the best one for the matchup. Fetchlands: I’ve been bouncing between 5 and 6 fetchlands lately. We badly want a fetchland in the first couple turns of the game, but they become our worst lands by the mid-game. Exceptions do arise; Mishra’s Bauble and Tireless Tracker both extract extra value from fetchlands. But I’ve had them be dead occasionally, and the damage adds up. Fetchable lands: Having targets for fetchlands wasn’t a problem when I ran Breeding Pool in the main, but since switching to Wastes, 6 fetchlands feels like it might be too many. Among these lands, I think at least three should be basics, including 1 Mountain. It’s possible the 2nd Forest can be cut for another shock. Utility lands: Right now, my only mainboard utility land is Wastes. The fourth basic stands to help out against Assassin’s Trophy (I have yet to test that), and it’s a colorless source we can Traverse for in lieu of delirium. Having a Wastes in the 75 blocks Blood Moon and Field of Ruin from ever cutting us off colorless. It pays in this deck to deploy lands very conservatively, at times holding up to four additional lands in hand. A topdecked Faithless Looting can turn those lands into threats. Because of Bauble and Tracker, fetchlands are the most valuable type to hold. Pilots should play out lands so that they have enough to Loot and make a desired play, or flashback Loot and make a desired play. Properly pacing land drops requires a solid understanding of what’s in the deck and the paths available should one card or another be drawn. The sideboard, too, is a work-in-progress. Lately, I’m wondering if Huntmaster of the Fells and Magus of the Moon can be cut. The former seems a little redundant as a bullet—if we’ve stabilized the board, won’t Tireless Tracker or Smasher put the game away, even against small creature decks? As for the latter, are there decks besides Tron it’s there for? If not, I’d rather have a third Damping Sphere. The rest of the sideboard feels great. 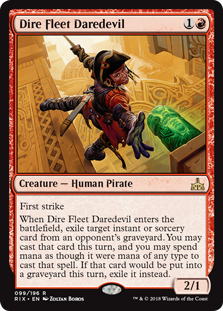 Dire Fleet Daredevil shines in Goyf mirrors, Kozilek’s Return wrecks small creature decks, and Stubborn Denial runs circles around anyone casting pricey spells. Cavern of Souls is also riotous against the UW decks. After putting this deck back together, I promptly went 4-0 at my LGS and came home eager to share the updated TarmoDrazi with the world. If anyone else takes it for a spin, be sure to let me know how it goes! I really like your style of decks. This one is also interesting. Do you have a sideboarding guide or guide lines for popular matchups? Not really, as I change up my plans often. But in general, I take out Bauble against the highly interactive decks that fill the grave for us (targeted discard). Stubborn package tends to come in for removal/Traverse the Ulvenwald and the bullets. Traverse itself is not great against linear combo-style decks because it’s harder to get delirium. Sphere vs. decks that lose to it. Same goes for the other bullets. Breaker for Bridge. Hope this helps! I expected you to bord Denial vs. UW. What’s your UWx control plan? Any new insight on the cards you are considering cutting from the SB? Speed is less critical against UW, and Hierarch’s a liability vs Sweepers. We want the deck to be full of creatures that can kill UW by themselves or otherwise force a sweeper. Tarfire kills the same stuff as Bolt except for walkers. Bolt specifically is awesome vs Jace. Dismember kills Angels and Colonnades. Cutting fetches for the lands because we run out of fetchable lands in this matchup and don’t need delirium so fast. SB may want a 3-damage solution for Humans. I’m also trying without the 2nd Forest (going to just 3 basics main). Deck felt amazingly consistent. Like it a lot more than conventional bbe builds of G/R. I feel like if I was going to make any changes it would be for some more graveyard hate like cage or surgical. Main deck feels super trim though.